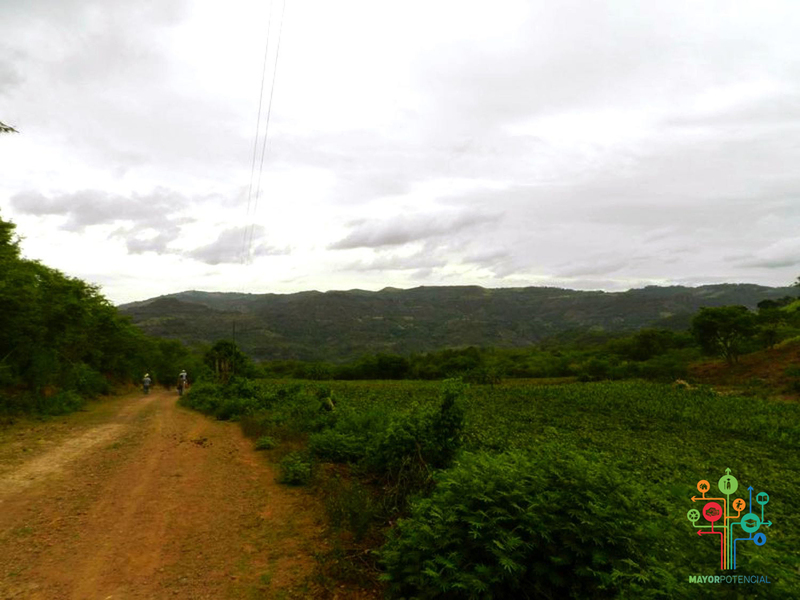 In the remote village of El Rodeito in central Honduras, students who graduate from elementary school must walk two hours along hilly, rock-covered dirt roads to reach the nearest high school. Soon, however, the students may not have to travel so far after a new high school designed by two Cornell architecture students is built. Developing a high school in El Rodeito is the focus of Mayor Potencial (which means "greatest potential"), a nonprofit organization based at Cornell that was founded by Nancy Bell ’09, a Cornell graduate student who grew up in the village. In the fall of 2015, a student club formed by Mayor Potencial, started raising the $30,000 needed to start construction on the school. After being selected to design the school, Liam Martin (B.Arch. ’17) and Tim Ryan (B.Arch. ’17) travelled to El Rodeito — population 210 — during last spring break and summer to gather feedback from students and community members on their sketches and to survey the two-acre site where the school will be located. "I think the most fulfilling part was showing them the designs the first time and seeing their faces light up," said Martin, who is from Lexington, Ky. "It was actually really emotional. They were just blown away by the images that we showed them." What made their presentation of the virtual model of the school so powerful was that it was the first time residents of the village had seen a computer, Bell said. The residents were also astounded when they saw photos of their children, which Martin and Ryan had taken in the spring, superimposed on images of the building. While working on the design for the school in Honduras, Martin and Ryan collaborated with a licensed architect in the Honduran capital, Tegucigalpa. Although the design is now complete, construction can not begin until Mayor Potencial raises $30,000 to pay for the first stage of the project — a building that will house three classrooms for the high school. So far, the group has collected $6,500 toward that goal through Cornell's crowdfunding website. To add a unique feature to the buildings, Ryan said they transformed the metal grating that must be installed on the windows for security into sculptures that will be fabricated by local metal workers. "Maybe these windows could illustrate parts of the agricultural process," said Ryan, who is from London. "For the library, they could show the traditional legends they have like the various creatures and goddesses to form a more fantastical space." In a separate project, the two architecture students are also designing a guest house that would be used by the groups of Cornell students who travel to El Rodeito to volunteer in the elementary school or the local medical clinic. The facility, which is a ten-minute walk away from the school campus, would include two buildings that would each accommodate 25 students. Service on a local to local level, that’s how the Cornell Commitment partnered with Mayor Potencial for its fi rst international service trip. 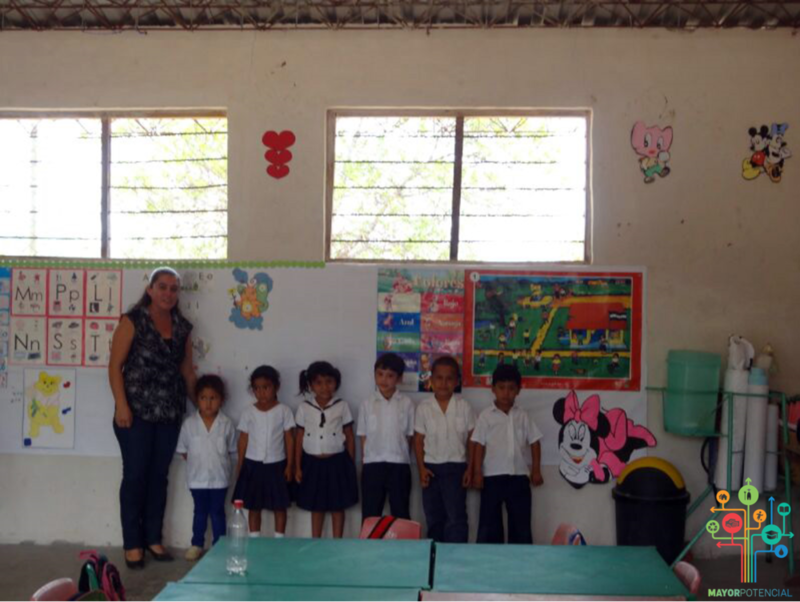 Before the start of the spring 2015 semester, 12 Cornell Commitment students traveled with staff member BJ Siasoco ’07, to El Rodeito, Honduras, to assist the local elementary school with math and English instruction. To read the full article, click here and go to page 3. (Left to Right) Khanh Phuong Tong '15, Nancy Bell '09, Allison Liang '15. Allison Liang ’15 spends her days as a research assistant at the Tisch Multiple Sclerosis Research Center in New York, conducting experiments that may uncover the cause of the neurological disorder. But she also takes time out of her daily schedule to volunteer for a project she feels passionate about — Mayor Potencial. In her junior year at Cornell, Liang began volunteering with a club on campus supporting Mayor Potencial, a nonprofit organizations that is raising money to improve the educational system, health care clinic and small businesses in El Rodeito, a small village in Honduras. The group was founded by Nancy Bell ’09, a Honduran native and a graduate student in human resources at Cornell. "I've always been interested in giving back to my community," says Liang, who is now Mayor Potencial's corporate sponsorship coordinator. "I am committed to working with Nancy to continue pushing toward our goals." Liang is one of several Cornell alumni across the country who are still actively involved in Mayor Potencial, which is now raising $30,000 in seed money to start building a high school in El Rodeito. Currently, the village only has an elementary school, and students must walk an hour and a half along hilly, rock-covered dirt roads to reach the nearest high school. Mayor Potencial launched a fundraising campaign for the high school in November on Cornell's crowdfunding site. Projected to cost a total of $150,000 to build, the proposed school was designed by two architecture students at Cornell. 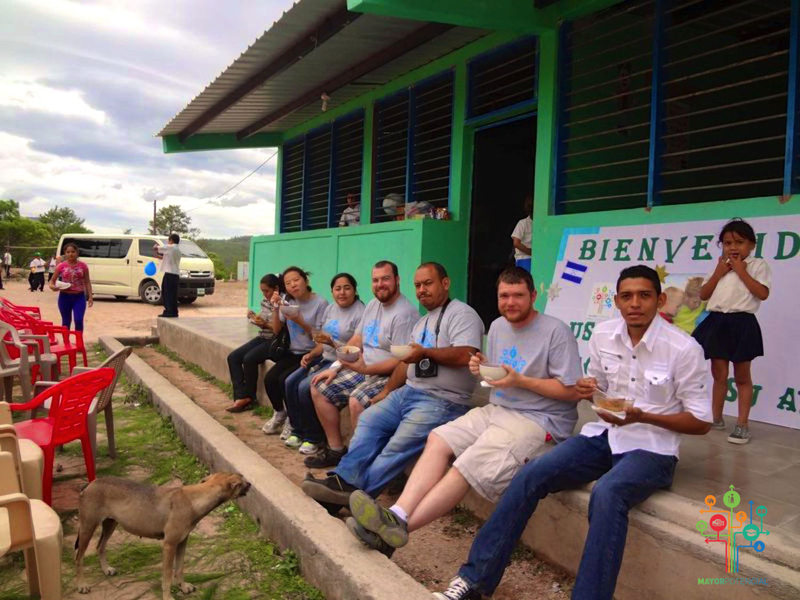 One of the ways alumni are remaining engaged with Mayor Potencial is by joining the groups of Cornell students who regularly travel to El Rodeito to volunteer at the elementary school and at the village health clinic. Jenny Tobat ’15 traveled visited the village twice last year — initially for a week during winter break and then for a five-week internship last summer. "I kind of felt guilty about my first visit," says Tobat, now a student at the Washington University School of Medicine in St. Louis. "I felt it was more toward our enjoyment than to their benefit. I wanted to help after being there and seeing the conditions were so different from what I was used to." 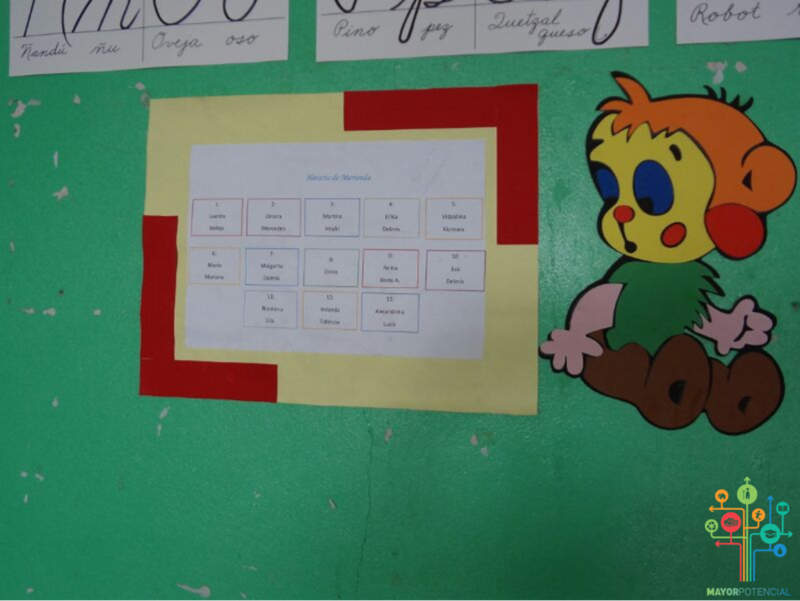 So last summer, Tobat, a math major at Cornell, returned to El Rodeito to teach math, science, Spanish, English, and preventive medicine at the elementary school. "It was mostly basic stuff, like washing your hands and sneezing into your elbow," Tobat says. "We taught about germs and how to brush their teeth. Dental care is really lacking there, A lot of them have stains and holes in their teeth, and we also gave out toothpaste and toothbrushes and we all brushed together so we could see they knew how to do it." Since graduating in May, Khanh Phuong Tong ’15, a program coordinator for the University of Washington Medical Center in Seattle, has been working on the fundraising campaign and helping with Mayor Potencial's website. She will visit El Rodeito in 2016 with a group of Cornell students who will be working with businesses in the village in January. "I know Nancy personally and I know that she's committed to this," says Tong, who is now Mayor Potencial's chief operating officer. "It's important for me to be working with an organization that I can clearly see their message and I believe in it. I will continue to make sure that we reach our goals." 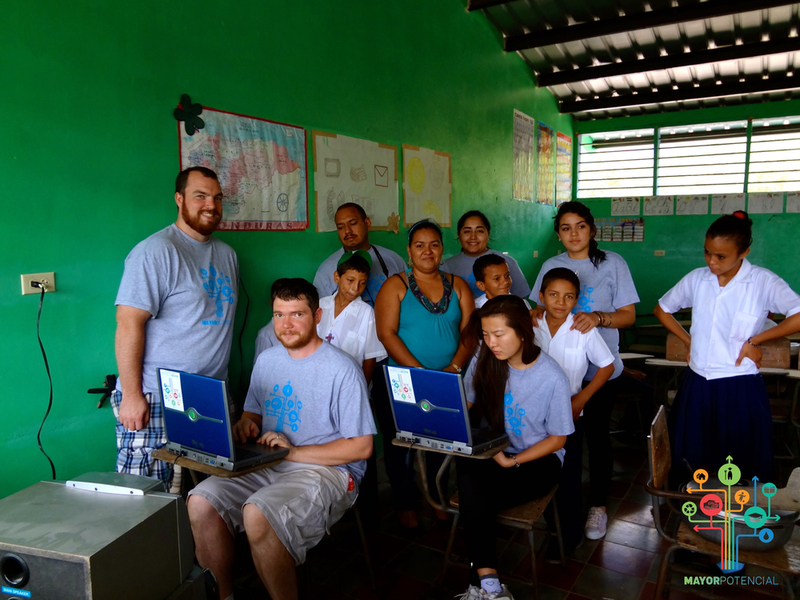 One of the projects Tong is spearheading is a pen pal program between students at the elementary school in El Rodeito and students at the Covenant Love Community School in Dryden. The program came about after Tong contacted a teacher at the school who wanted to donate books to a local nonprofit. Bell said she hopes Cornell alumni will remain active with Mayor Potencial, either through helping with the fundraising and website or by visiting El Rodeito. "Staying involved makes for lifelong friendships and the ability to keep making a positive impact from afar," Bell says. As Cornell students, they have already made an impact, but by staying involved, they can make a lifetime of difference." For many elementary school students in El Rodeito, Honduras, life after sixth grade means working on the family farm and starting their own families. But after meeting a group of Cornell interns last summer, the children now have visions of becoming lawyers, professors, or film directors. 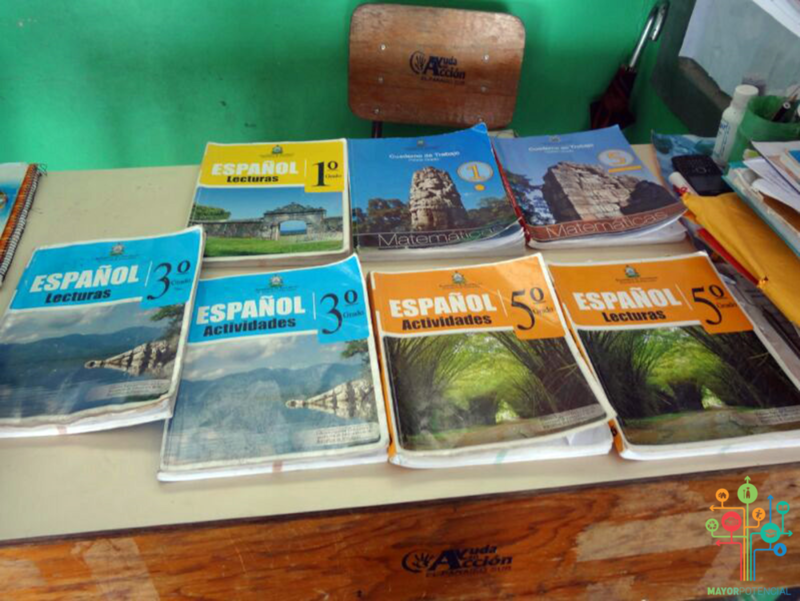 When the five interns arrived in El Rodeito last June, only ten of the 40 students in the village elementary school said they planned to enroll in high school. But after participating in a career workshop presented by the interns, nearly all the students said they wanted to continue their education. "Once we put a little ambition into their eyes and they saw which of their occupations required a high school degree, a lot of them changed their minds," says Krystin Chiellini ’17, a biology and society major from Tampa, Fla.
During the six-week internship, the interns taught English, science, math, and preventive medicine in the elementary school, while assisting the three teachers assigned to the school. They also worked in the village health clinic, collecting data on patients and conducting an inventory of the medical supplies. The internship program was initiated by Nancy Bell ’09, a Honduran native who founded Mayor Potencial, a Cornell-based nonprofit group that is raising money to improve the educational system, health care clinic, and small businesses in El Rodeito, population 200. 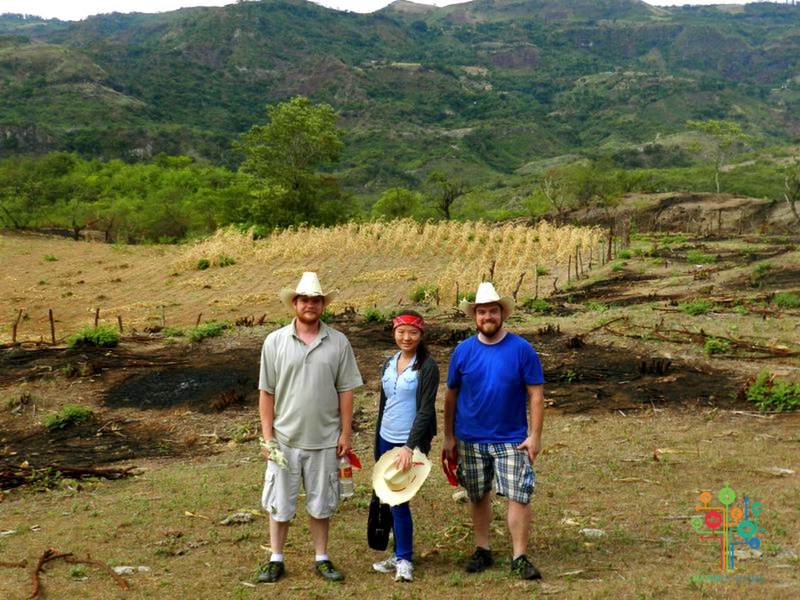 Bell, who is working on a master's degree in human resources at Cornell's School of Industrial and Labor Relation, recruited two of her cousins in Honduras to supervise the interns during their stay in El Rodeito. Although groups of Cornell students have visited the village three times in the past year, Bell wanted to start a summer internship so that the students could work for a longer period of time in El Rodeito and could have more of an impact on the students. "When you do something for six weeks, you really form connections with the people you're living around and you really get a sense of what they have to deal with on a daily basis," says Connor Goldman, a pre-med student at Vanderbilt University who joined the internship program after learning about it from a friend at Cornell. When the interns arrived in El Rodeito, they brought with them 80 sets of toothbrushes, toothpaste, and dental floss for the children, all donated by Dr. Matthew Dentes of Cortland. The interns then had to teach the mothers and children in the village how to brush their teeth. "They've never seen a toothbrush before," Bell says. "For people living in extreme poverty, they have to decide between food or anything else. It's really hard." Another discovery the interns made was the lack of nutrition in the children's diets. After conducting an analysis of the body mass index of the school children, the interns found that 50 percent of the students were stunted due to chronic malnutrition, says Santana Silver ’17, a biology and society major from Santa Barbara, Calif.
"Most of them were getting enough calories," Silver says, "but they weren't getting the correct nutrition and vitamins so they're not developing correctly." What the interns found especially rewarding during the summer was the direct impact they had in the classrooms at the elementary school. Since there is only one teacher for every three grades, the interns were able to give the students more attention in their classes. "I think having that individual interaction really helped them hone in," Chiellini says. "I think that was also something they had to adjust to because they weren't used to it." On Oct. 26, the students gave a presentation on their summer experience to the Social Entrepreneurship Field Study course taught by Deborah Streeter, the Bruce F. Failing, Sr. Professor of Personal Enterprise and Small Business Management in The Charles H. Dyson School of Applied Economics and Management. Students in the course plan to take an eight-day trip to El Rodeito in January to help small business owners identify global markets for their products. Chris Yoo ’18, a computer science major from Atlanta, Ga., says he would like to return to the village in the future to continue working with the school and the health clinic. "It was an experience where it didn't matter how much it cost for the plane ticket or how I had to take showers in a well — all of those things could not outweigh the amount of fun and learning I had when I was down there," Yoo says. Nancy Bell, poses with previous President, David Skorton (left), and current Vice President, Susan Murphy (right), at 300 Day Hall on April 8th, 2015. Nancy is with Cornell President, Elizabeth Garrett (right), at the Hall of Fame Room in Schoellkopf Hall on September 15th, 2015. 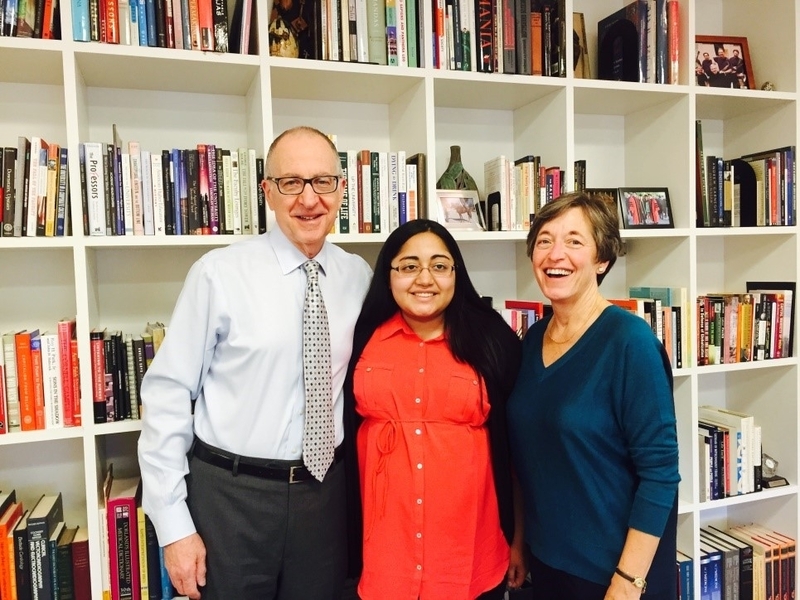 Nancy poses with Dean of Cornell’s College of Agriculture and Life Sciences, Kathryn Boor (left). This photo was taken at President Garrett’s inauguration ceremony on ­­September 18th, 2015 where Nancy was privileged to walk and carry the symbol for CALS. Red Ideas is a new group on the Cornell campus that aims to foster discussion and support implementation of creative ways to "improve humanity", be it through research, humanitarian aid, development projects, etc. The children happily line up to take a class photo. 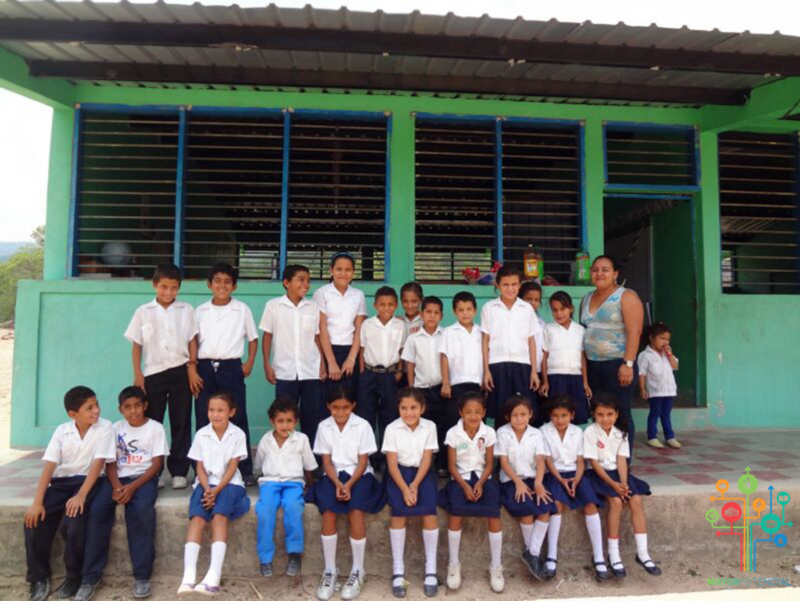 Ramón Rosa is a relatively small school in El Rodeito, Honduras, which currently holds about 39 children. The children are, for the most part, from farming families in the neighboring area. Ramón Rosa and the community as a whole have been very supportive of Mayor Potencial and of our efforts to improve living conditions for the residents of El Rodeito. El Rodeito is about 4 hours away from the closest city. The weather is very warm and dry. The village is located in the mountains and is surrounded by farming lands. The school is in need of many resources, including crayons, books, chalk and much more. One of Mayor Potencial's principle goals is to eventually provide much of these resources to the school so as to improve its academic curriculum. 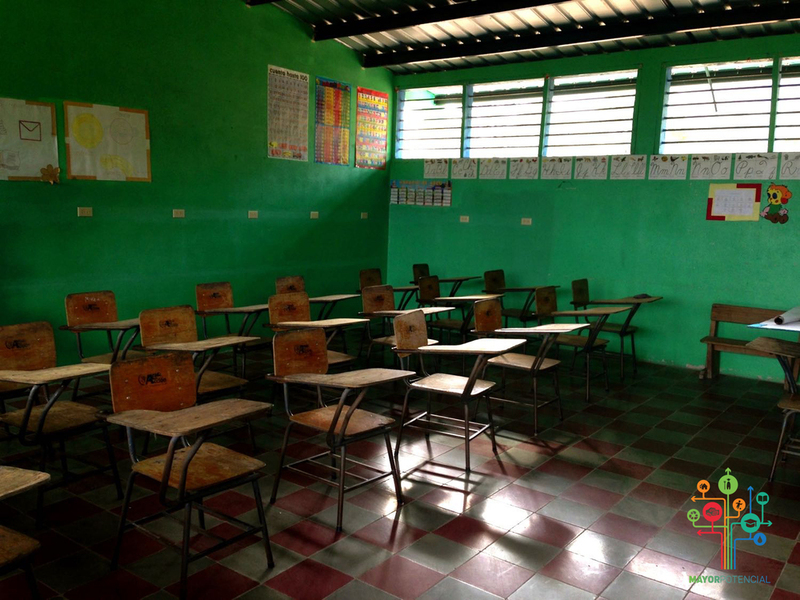 In Honduras, governmental resources towards education are largely insufficient. Teachers do all that they can to improve the education of children and sometimes even buy the school supplies themselves. However, they struggle due to their low salaries and can only do so much. In El Rodeito, it is not uncommon for children, especially boys, to be pulled out of school at a young age so as to go work on the farms to provide for their families. One of our long-term goals is to increase household income in order to reduce the need for manual labor and keep children in school. Opportunities for girls, specifically, in the community are very limited. Women usually hold the traditional position of wife and mother and are not given many other choices. Through our educational program, we hope to educate young girls about the options that they have and to teach them ways to provide financially for their families in the future. We hope that this will add a source of income for the family and reduce the need to pull children out of school for manual labor. 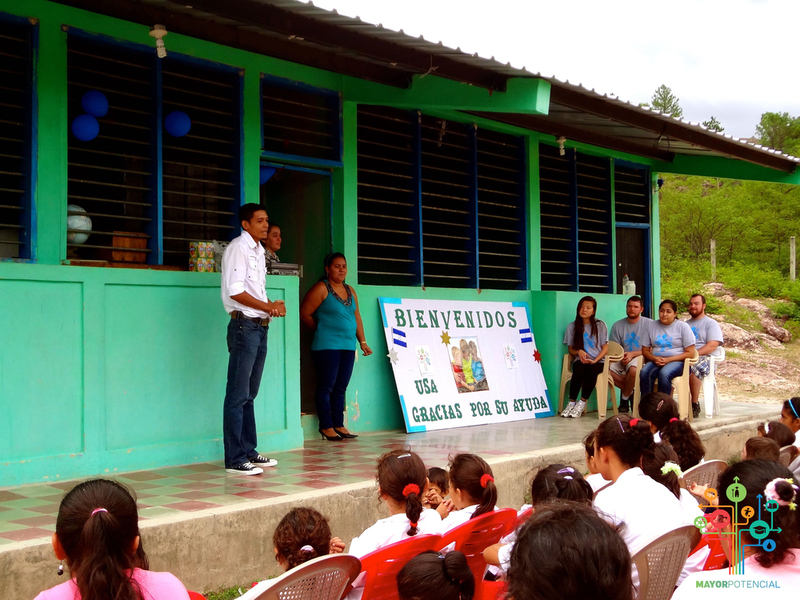 During the Summer of 2014, Mayor Potencial visited Ramón Rosa and installed electricity in the school. We hope that this new amenity will help improve the school conditions and make life easier for the teachers and children. Mayor Potencial also planted trees around the school so as to improve upon the rocky surroundings. The team cooked a meal for all of the children. They then served everyone and ate all together in the main yard. Mayor Potencial donated 2 new computers to the school to aid the teachers and students improve the accademic curriculum and open up more possibilities for the children. 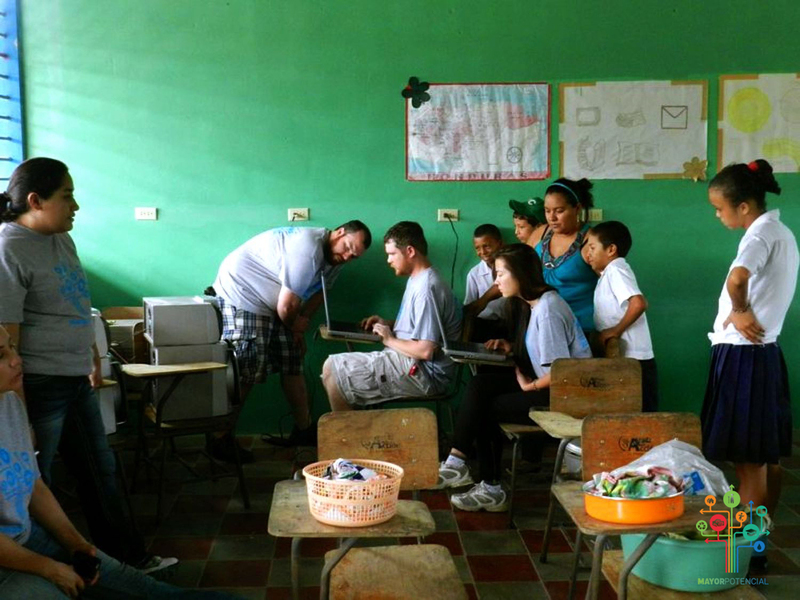 Members of the team set up the computers as children watch. At lunch, though some students bring snacks, most don't have anything to eat. One of Mayor Potencial's goals is to build a kitchen on the grounds. Because we have recently installed electricity in the school, we would like to build a more modern, easy to use kitchen. We hope to then create a meal plan for the children so as to entice parents to send their children to school, where they will be fed. Members of the community have already made pledges to donate farming produce to the program. The Children are Always Happy to Take a Picture! While in El Rodeito, Mayor Potencial had a chance to meet a local family and discuss ideas for improving the community. Tradition and culture play a large role in the community. 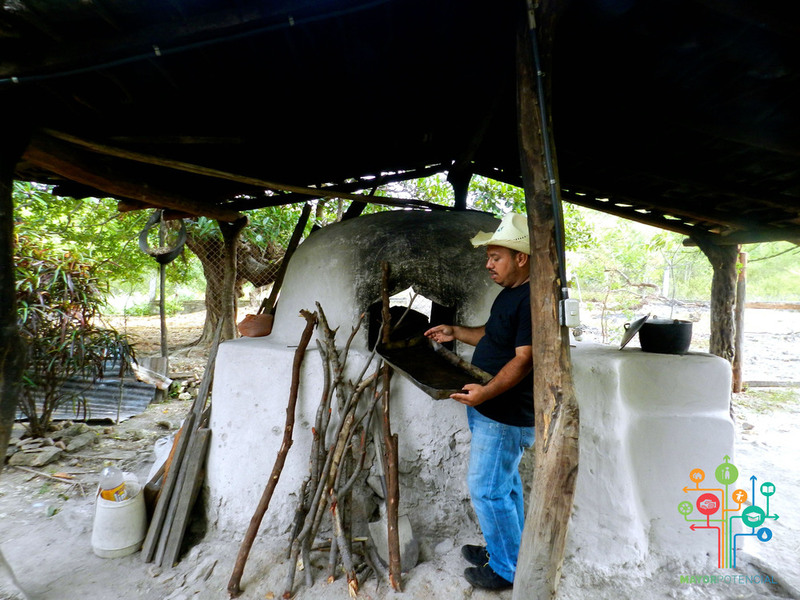 El Rodeito residents try to preserve building practices, cooking conventions and schooling customs. Though the community embraces change to some extent, it is important to them to maintain some aspects of their traditional culture. 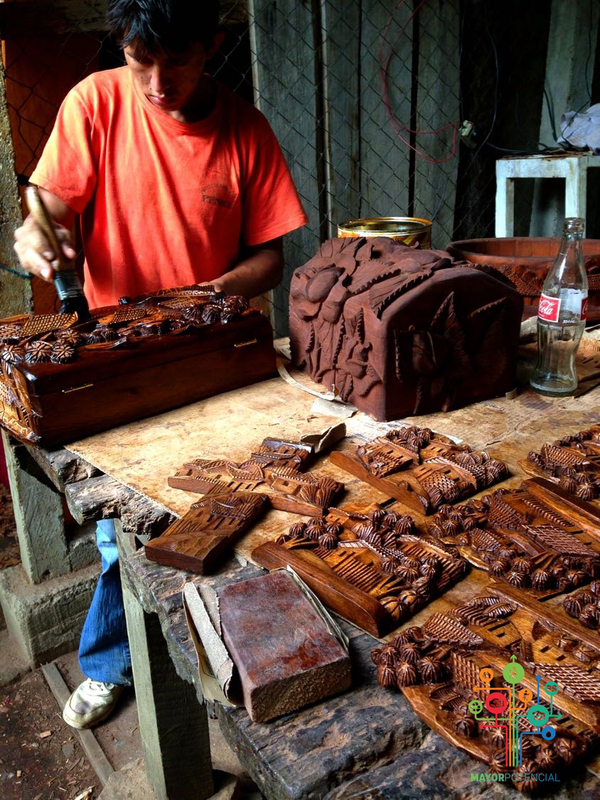 Honduras has a rich culture of artisan work that has been passed along for many generations. One of our goals is to expand trading opportunities for the community and give residents the option of selling their work in Honduran cities as well as internationally. 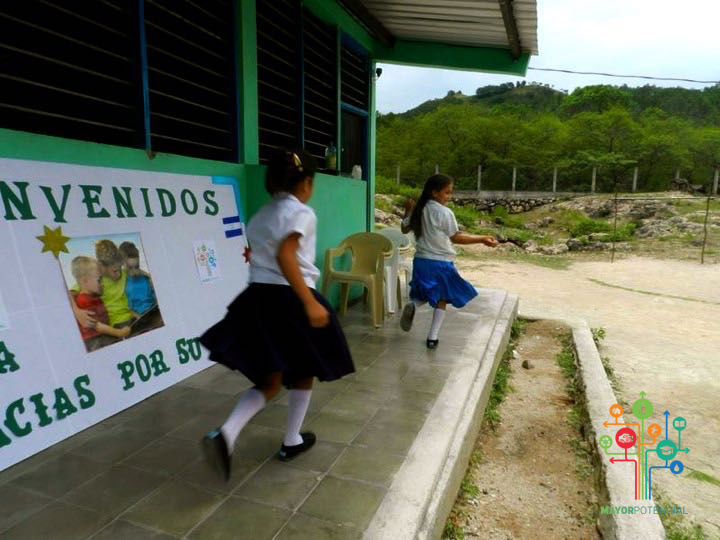 One of the goals of Mayor Potencial is to implement permanent and efficient changes throughout Honduran communities in order to improve living and learning conditions. In part, we hope to implement this by providing nurturing environments for students. These changes are implemented through the provision of resources, but also in the construction of new facilities. Currently, we are focusing our efforts on building a kitchen on the grounds of Ramón Rosa in order to provide cheap and nutritious meals to students.